The Joker? Forget about him, Harley Quinn is the star of the show. DC Comics is taking on Marvel in 2016 with a pair of superhero epics: Batman v Superman: Dawn Of Justice and Suicide Squad. The latter, which just premiered a new trailer, centres on a group of villains assembled by a government agency to undertake a perilous mission. This Suicide Squad’s reward? Clemency for past crimes and the possibility to start life anew. To date, Jared Leto has been the headline thanks to his ‘method’ approach to playing The Joker. From sending a live rat to co-star Margot Robbie, gifting a bullet to Will Smith and insisting the crew refer to him as ‘Mr J’, the Oscar-winner has jumped headfirst into playing the cackling Clown Prince Of Crime. And yet, going by the latest Suicide Squad footage, it looks like the limelight has been completely stolen by Margot Robbie’s Harley Quinn. Check her in action below. Smeared in clown make-up and wielding a baseball bat, Quinn is the psychotic girlfriend of The Joker – a psychiatrist who tried to mend his messed up mind and ended up falling under his spell. Suicide Squad isn’t even out in cinemas until August 5, but Quinn has already attained cult status. Last Halloween she ranked as the most popular comic book character outfit on Google’s ‘Frightgeist’ search trends. Come this October, you probably won’t be able to escape her. 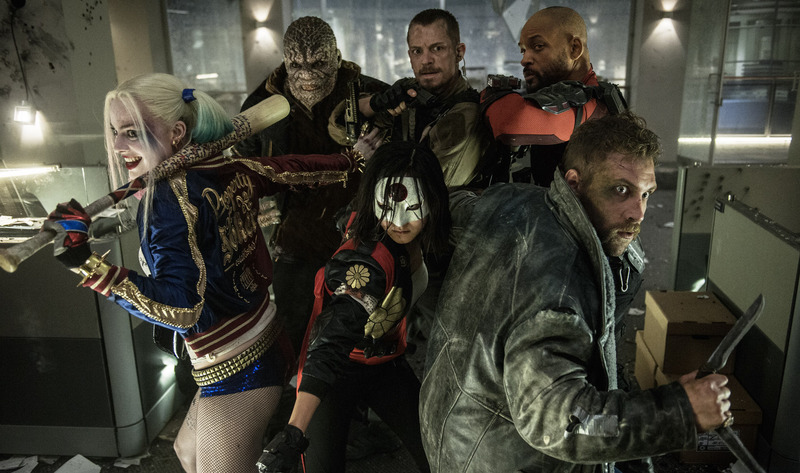 There’s plenty more star power in Suicide Squad besides Robbie and Leto. Will Smith is onboard to play masked sniper Deadshot, Cara Delevingne will wield magical powers as Enchantress and Ben Affleck will make a blink-and-you’ll-miss-him appearance as Batman.